I often times feel like there are these notions in art education that you have to pick a side. TAB vs. not TAB. Project-Based vs. Non-Project Based. Guided Drawing vs. Guided-Drawing-is-the-Devil. Here's why I HATE when I'm forced to feel like I have to pick a side. 1. It pits art teachers against one another. Look, everyone's end goal as an art teacher (at least I hope) is for our children to realize the power of their imagination and creativity. It can boost their self-confidence, give them mental strength and allow them to see all of their creative potential! How we, as teachers, get our students to that point, varies. We are all in different situations, with different schedules and different standards and curriculum. What might work swimmingly for me and my diverse students, may not work well for another in their setting. Does that make them wrong? Does that mean they are doing their students a disservice? Something tells me that if an art teacher is giving it their very best...not their most perfect because that's just unattainable, but THEIR very best...than isn't that enough? Should we really beat them up if their best looks different than ours? 2. 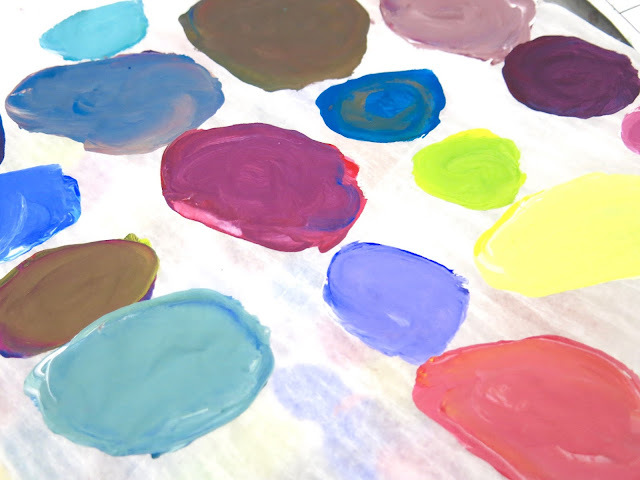 It paints a black and white picture of art education...in our beautifully colorful world. How we teach art is not black and white. You don't have to pick a team or a side. 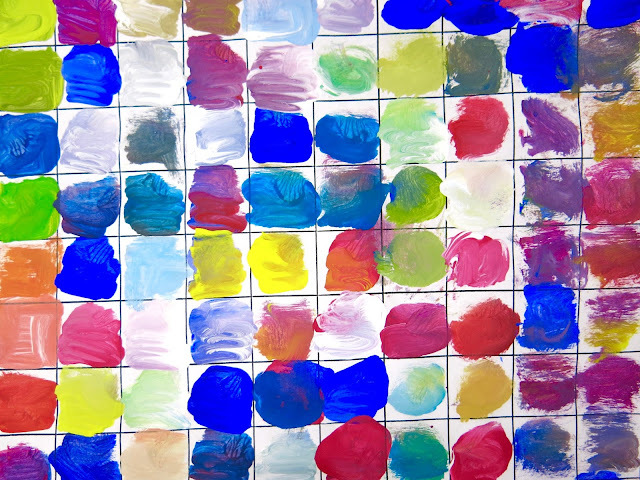 I like to think of all the wonderful ideas on art education as tools in my toolbox. 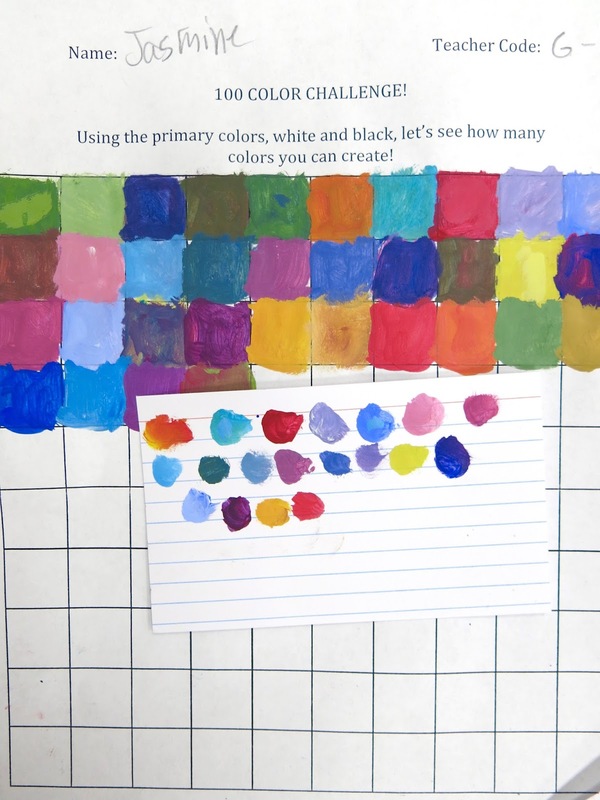 When I use a variety of tools: guided drawing, open studio, center time, project-based, etc., I notice that I'm able to reach ALL of my learners. If I only used one tool in my toolbox, like guided drawing, for example, then my students would only become good at following by example. There's only value in that type of learning if we combine it with other types. 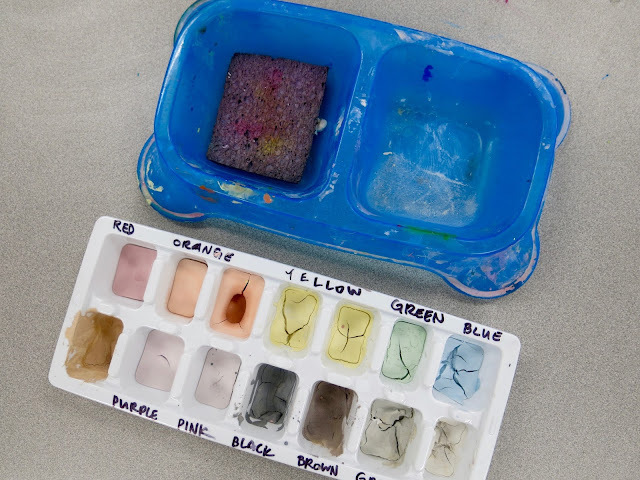 This allows our students to see the importance of what they are learning and how they can apply it to their creative life inside and out of the art room. With that in mind, I really feel like Guided Drawing gets a bad wrap. I use guided drawing as a tool in my toolbox with MANY other tools. 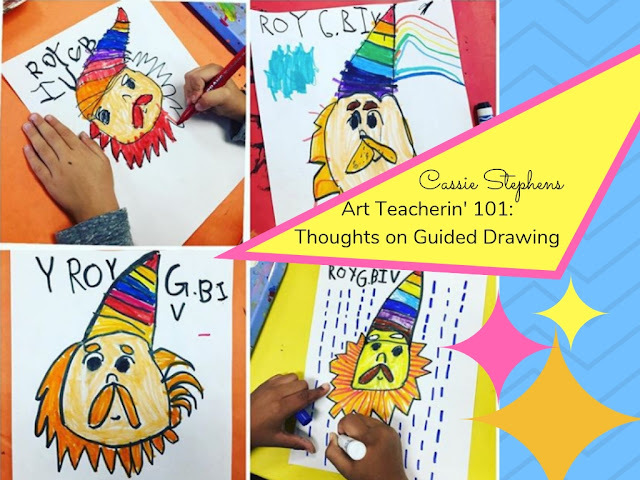 Here's why I value guided drawing and how my students enjoy it with success, confidence and happiness. So, what are your thoughts on guided drawing? Or any other method of art teacherin'? I've been teaching art for 20 years. For new teachers, I can only imagine how confusing and difficult it must be to hear all of this art edu-jargon. Just know that if you feel you are trying your hardest and your students are responding, you are doing alright. Trust me...your students aren't going to remember some fancy edu-jargon...they are going to remember that you loved on them, created with them and encouraged them every step of the way. And, fingers crossed and knock on wood, that will be enough to have them realize the power of their own creative potential. If you are interested in seeing more of my guided drawing lessons, you can use the search bar on this blog...or you can check them out below! 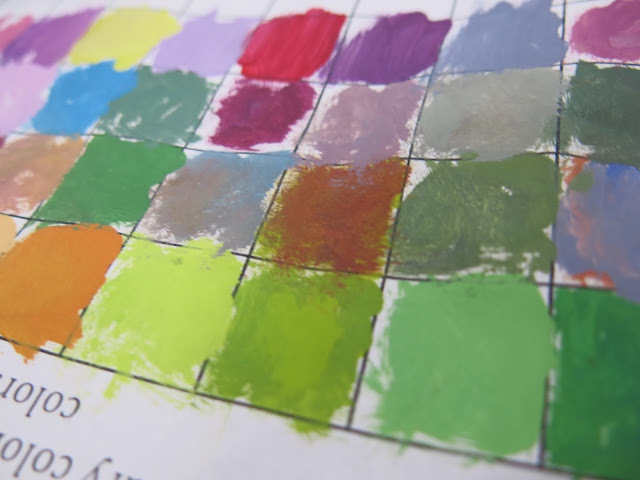 Many of my guided drawing lessons are VERY open ended so the kids can really explore with confidence. There are MANY MORE lessons on my YouTube channel if you'd like to check them out! 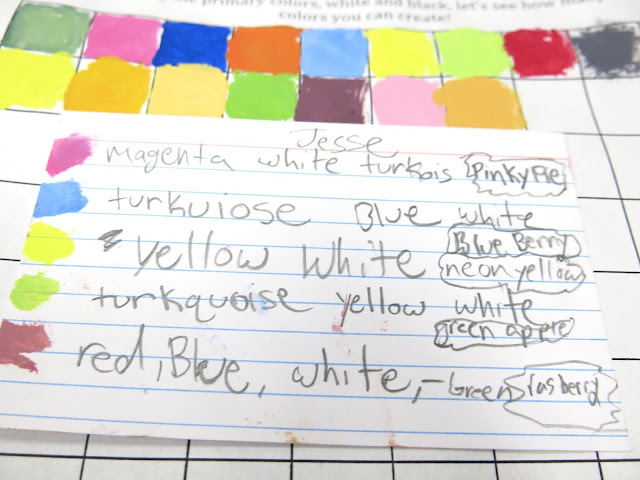 In the Art Room: Lesson for Evaluation! By the way, CAN WE TALK ABOUT THAT WALL BEHIND ME?! I mean, pretty sweet, right? If you follow me here, then you are familiar with the massive art room transformation I've been doing. I'll be certain to share more details soon! In the meantime, I'm so happy everyday that I have the privilege to teach in such a space. They'll be painting their tubes next...but first, they had to come up with their own unique color, write out a recipe and give their color a name. 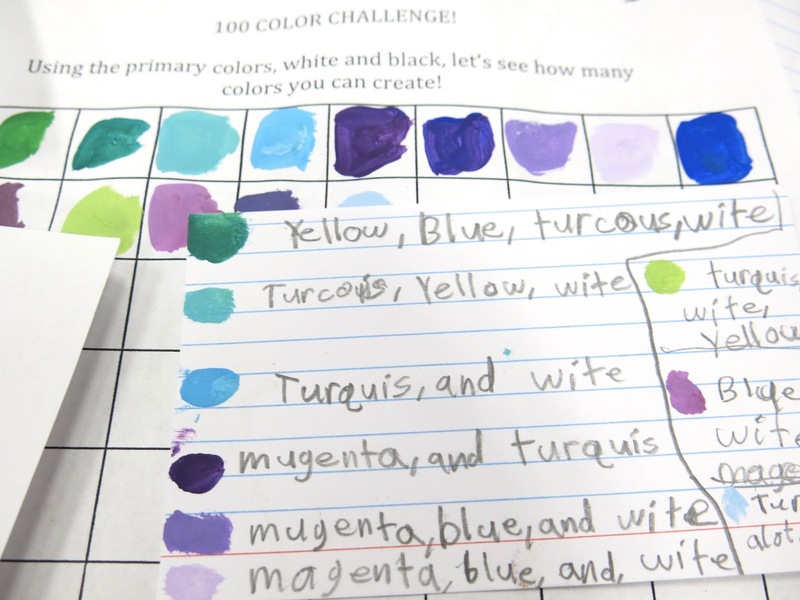 BUT FIRST...they had to at least attempt the 100 Color Challenge! 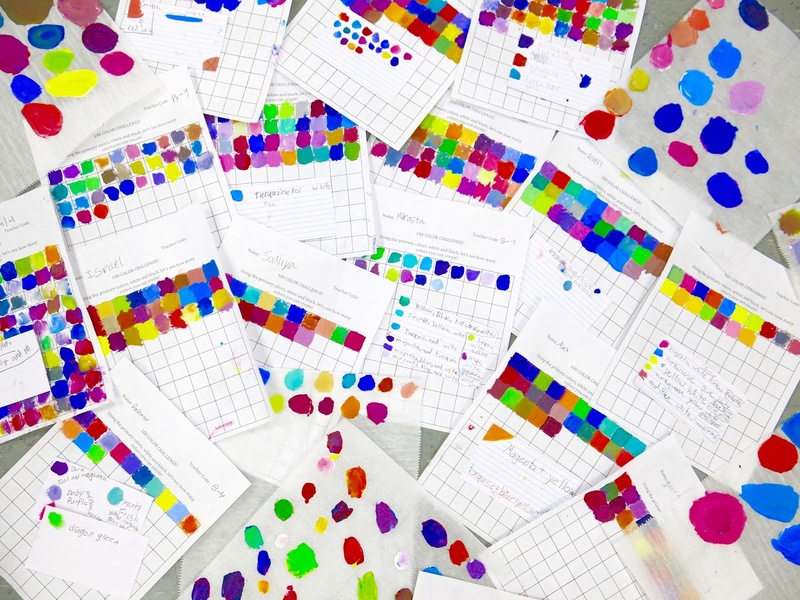 Here's why this lesson is great to use during your evaluations: it provides a pre/post assessment; it is cross-curricular in that you can mention science, literacy, math and creative writing. 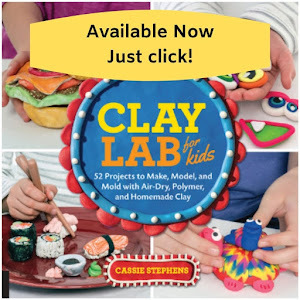 It's highly engaging and FUN! Not to mention, the kids learn so stinkin' much. Now...I only had a couple of kids finish the challenge....and I don't plan on returning to this lesson. I feel like it would start to get stale and redundant. BUT...I do foresee it being a great way to introduce multiple media. After all, its the 100 Color Challenge...so perhaps next up will be watercolor, color pencil, pencil with a value scale to wrap up the 100 squares. Their papers are so stinkin' pretty. I think this would be a GREAT teaching tool at the start of the year...or each time a new media was introduced. What a great reference sheet for the kids. I think this will have to be added to next year's sketchbooks. My favorite part of this lesson was when the kids excitedly shared their color mixing recipes. This was a great opportunity for my principal to see the discovery and the interaction of my students. 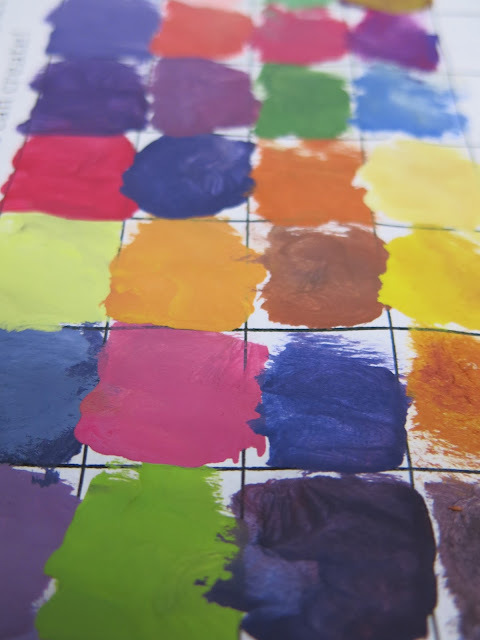 I loved this lesson so much, I even sat down and worked on my own color mixing sheet! 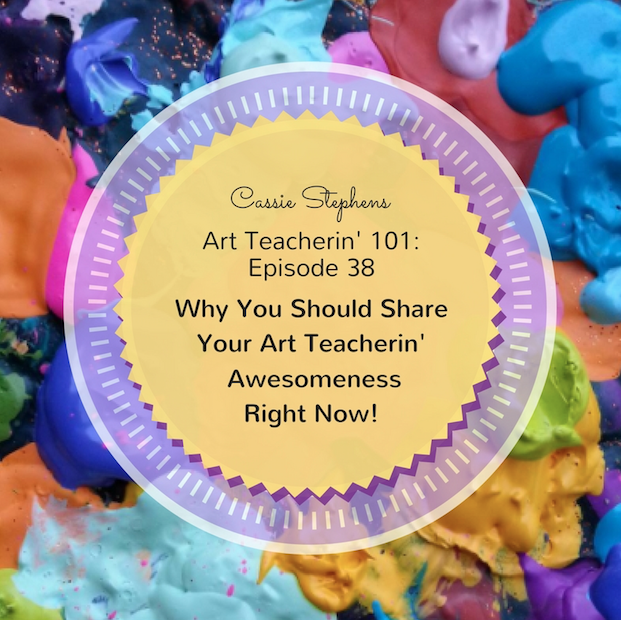 I know I'm not the only one who has done this lesson...I'd love to hear from you and how you used this lesson in your art teacherin' world! Haha!! I'm BAAAAACK with a lil Art Teacherin' 101 action, y'all. It's been since this summer that I recorded one of these bad boys. Between the podcast, the Wednesday night FB and IG LIVE chats, I kinda thought y'all might be a little bit tired of hearing what I have to say. Unfortunately for you, I STILL GOT LOTS TO SHARE (deal wit it). If you are interested in seeing more Art Teacherin' 101's then you can subscribe to my YouTube channel right here. If you'd like me to chat about something in particular during these AT's, you just let me know! Have a super week and remember: take it easy! Decorate to educate! You can take comfort in knowing that MY ART ROOM IS WAY MESSIER THAN YOURS! Winner of the Growth Mindset Coach Playbook announced at the end of this post! * Where to Share? That's one that deserves serious thought...and is totally up to you, your time and your favorite means of communication. Are you a visual person? Try an Instagram account for your art teacherin' outlet. 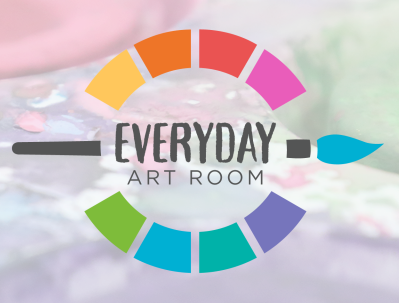 Love to chat and interact with other art educators? Twitter might be your jam. Facebook is kind of a combo of both and the most popular...therefore a great way to reach many parents and peers. Make videos for your classes? Consider sharing them on YouTube. Blogging, well, I'm not gonna lie, that one requres a lot of time and effort to reap the reach-of-desired-audience rewards. Be honest with yourself. Do what you know you will enjoy...because that is what you will stick with. * Give It a Test Run. If you are going to start an Instagram account or dive right into blogging, might I recommend a test run. What I mean by that is this: keep your blog posts or social media accounts private for a pinch. Type up at least four blog posts; line up no fewer than a dozen IG posts and keep them private. Then step away from them for a few days. Did you enjoy typing up those blog posts? Is that something you think you'll enjoy doing on a continual basis? Great! Now you have four posts all lined up and ready to roll out. This will make it so you have some breathing room and don't feel like you have to crank out content and not enjoy the process. As for your social media, like Instagram, look at those images before making your account public. Do your images make sense together? Do they look like they belong with one another? Do they have your "mark", so to speak? It takes time to develop a "look". Be patient with yourself and pursue who you are. This will help you carve out your very own niche. * Beware of Being a Lookalike. When I first began blogging, it was way different than the blog you see here. 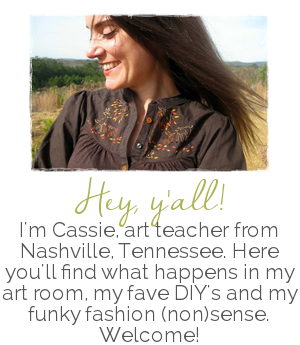 Back in 2007, it was a blog created to sell my Etsy creations (many moons ago, I created ceramic belt buckles), not share my art teacherin' pursuits. I had no idea what I was doing. I had just read on some Etsy forum that if you wanted to sell your wares, you should have a blog. So I had a blog. With no direction, no look, no vibe, no clue. I turned to my favorite blogs for inspiration...which became gentle copying, shall we say. I tried to fit myself and my blog into a box that I thought others would enjoy. 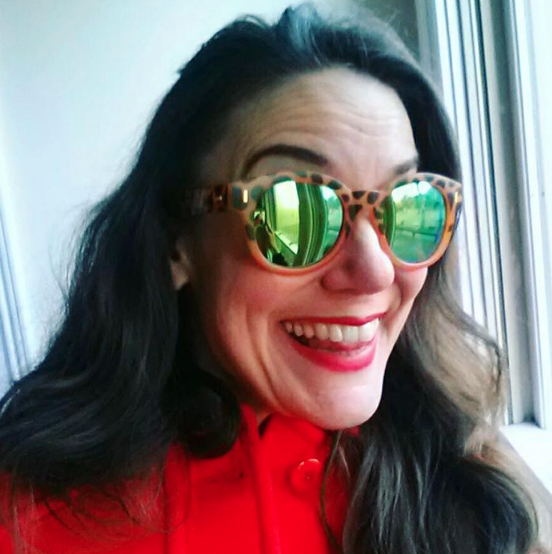 Needless to say, it felt unauthentic and I quickly dropped out of the blogging scene. Not until 2012 did the blog you see here come to life. It was at that point, I was ready to be myself and use my true voice. I threw the notion of what other folks might think out the window and just went for it. Staying true to my voice and my interests is what has made me a blogger for the last 5 years. Regardless of what social media path you take, follow your voice. If you feel something is off, if you feel untrue to you, stop. Change it. Be you. After all, YOU have something to share! So YOU should do it. Present! Post! Do what suits you. Just know that you have something powerful to say. And we want to hear it. 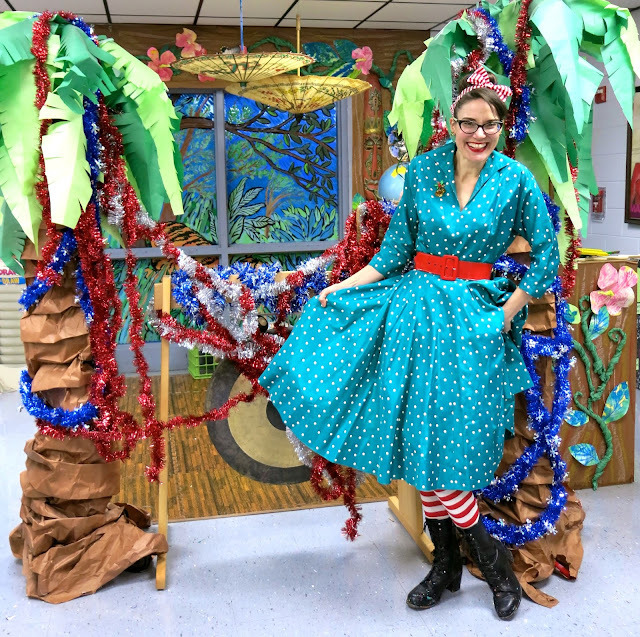 Congratulations to...Kimberly Schultze! Kimberly, please email me at cassieart75@gmail.com so we can chat about getting The Growth Mindset Coach Playbook in your hands! Art Teacherin' 101: Episode 37 GLAZE! My dog dishes, ice cube trays and just about everything else were purchased at the Dollar Tree. I love the Dollar Tree, y'all. If I could marry it, I totally would. Cassie Lane Dollar Tree. Has a nice ring to it, no? Once our glazing days were done, I tossed the press and seal I was using to keep the glaze fresh and let them dry out. Just a crack of the tray works to pop them out. Then put them in the glaze bottles, add water and shake. 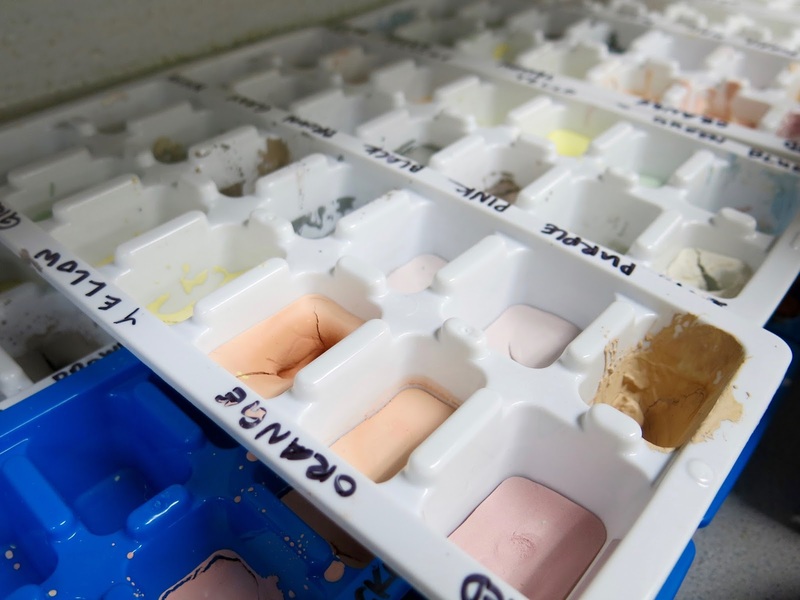 Clean trays + conserved glaze = happy art teacher! This is a messy task...and one that you will only want to do once. So get all your glaze bottles and trays out and knock it out in one fell swoop. You'll be happy you did. Clean (ish) glaze/ice cube trays and fresh glaze for the win, kids! As an art teacher and a human, I find that there are many things I struggle with: consistency, finishing projects before starting new ones and, most of all, organization. I like to think that my decent art teacherin' qualities outweigh the bad but there is no denying this...I'm an Art Teacher Hoarder. And one of these days, my cold and colorfully dressed body is probably going to be found under a mountain of toilet paper tubes, bottle caps, yogurt lids, wire hangers and gently used popsicle sticks ("Why was she saving THOSE?!"). They say the first step is admitting you have a problem, y'all. There, I've said it. Now what? Like a tour of my space, would you? Here you go! Just watch your step...I've just about boobytrapped the entire space. One of two things inevitably happens when I walk into my storage closet: I get injured by one of the art supply landmines I've haphazardly thrown on the floor or I find some amazing treasure, get a fun idea for a project and completely forget why I entered the storage closet in the first place. I had a group of fourth grade girls who decided to make my art room their hang out place every morning the last month of school. 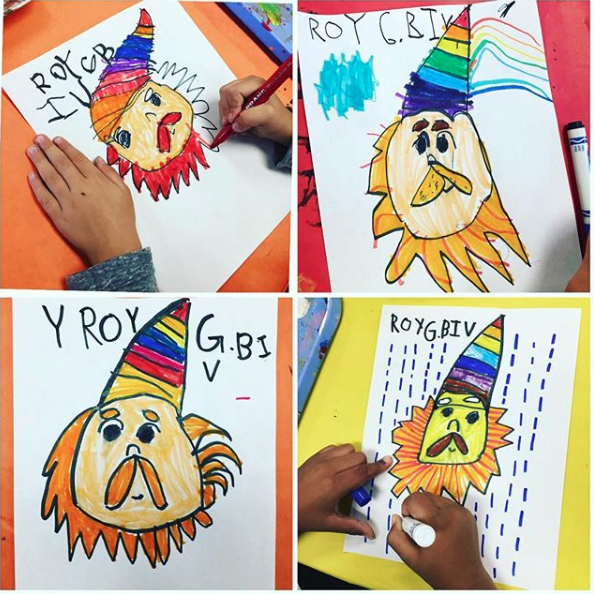 It was fun, like our own secret art club. They'd come in, take out whatever they felt like working on (sewing pillows, painting a poster, you name it) and create for a solid 20 minutes before the bell would ring. I didn't mind, I was just making coffee and enjoying their company and love for creating. One day I opened my closet in front of them and it was like the door to Narnia opened before their eyes: they were amazed. Not only by the mess but by the sheer volume of stuff. I let them raid the closet for fabric several times...not that you can even tell. They hardly put a dent in the place. With so many art teachers lacking supplies and space, I'm embarrassed to show just how much I've got and the large space I have to store it. 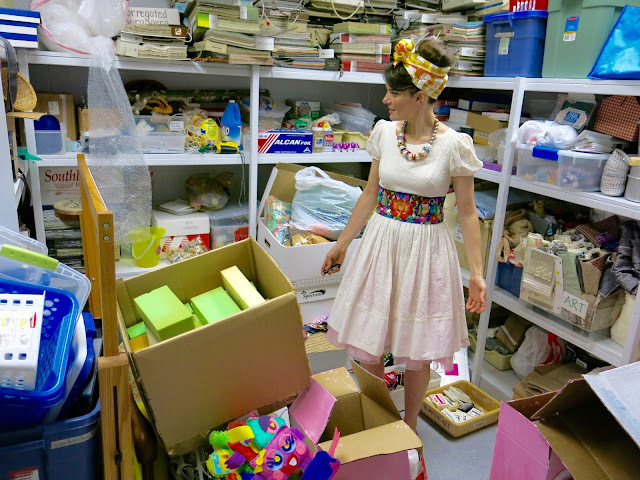 I am super fortunate for the donations that I receive and the closets I have to store them in. I'm telling you, my art room (along with the closets) is what got me so determined to land the job at my school. I literally stalked the former art teacher for two years to get the job (she's a friend who was retiring). I'm not even kidding: I went to her art shows, helped in her art room, observed her. When it came time for my interview, the principal and staff already knew who I was (probably because of the restraining order). All that to say, I know I'm spoiled rotten. And I'm every bit of that spoiled kid who has the messiest toy box on the planet. All this I know. This is why it's part of my summer routine to pop in to my art room for a couple of hours once or twice a week to start chipping away. I really and truly do want to start my new school year feeling organized and ready to roll...not chaotic like I usually do. I'll keep you posted on my progress. In the meantime, can I interest any of you all in a 5 lbs box of chopsticks that may or may not be used? 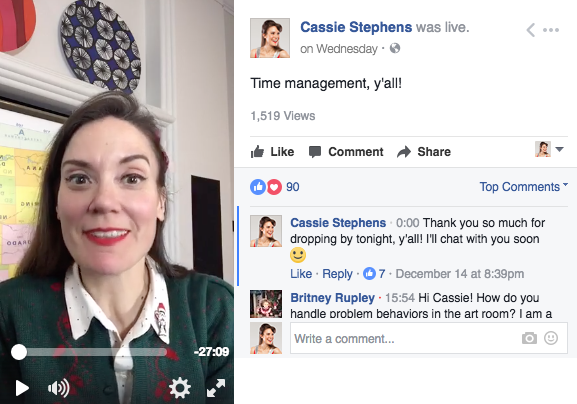 If you've been joining in on my Facebook LIVE chats which I (attempt) to host each Wednesday night at 8pm CST, then you know it's a large crowd of art teachers from all walks of art teacherin' life: we've got high school teachers all the way down to pre-K. Our common bond is our love for creating art with young artists...and the gamut of feelings that come with that: joy, stress, frustration, celebration, etc. I look forward to our chats each Wednesday as it helps me know that I'm not in this alone and that the feelings I experience are shared by many. At the close of our chats, I'll usually ask what we'd like to talk about the following week. One art teacher tentatively threw out the topic of burnout. 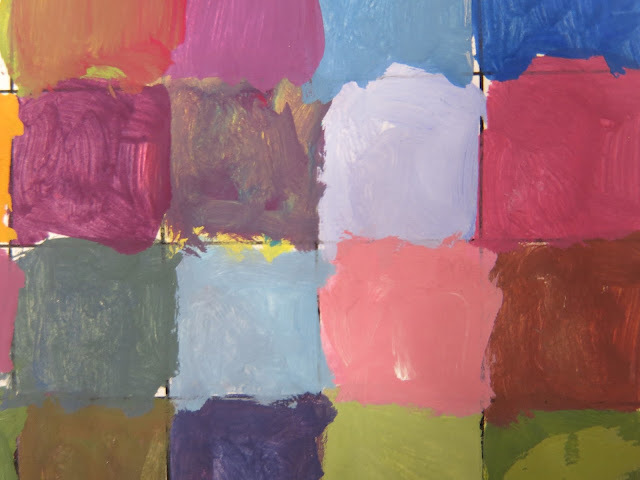 I think she was apprehensive to admit that she was experiencing this as what you often see here on this blog and on other social media platforms that art teachers use are the celebrations...not the frustrations. But, trust me, we ALL experience burnout. In fact, it was burnout that brought me to blogging! It was several years ago and I was feeling stuck in a rut. I wasn't excited about the lessons I was teaching and it was reflecting in my art room. Then I would become frustrated when my students weren't excited either. It became a bit of a cycle and I knew I had to do something about it. So I decided to create a blog. I figured that if I had to weekly share a lesson that I was proud of, something that I'd created and whatever wacky outfit I wore, it might inspire me to try a little harder, be more creative and give my approach to art teaching the reboot it needed. That's what worked for me. If you are going thru a slump, you need to find out what is gonna work best for you. Maybe it's taking some art classes. Planning a craft night. Taking a mental health day. It's a super short life we live, y'all! We need to be healthy, happy and have the energy to share our joy for art. You gotta do what it takes to make that happen. But know that burnout is just a part of life. I think of life as a cycle. And burnout is just one of those phases that we all go through sooner or later. Love to hear what you do when you find yourself in a slump. And I hope to hear from you on Wednesday night over on my official Facebook page. See you then! Ah, early finishers. Y'all know what I'm talkin' about: those kids who are "DONE!" like they are some sort of turkey dinner. And isn't it funny how "DONE!" is contagious? It's like popcorn kernels in a bag of microwave popcorn; once one starts poppin', they all do. So...what do you do with those early finishers? Check out this video for my tips, tricks and tour of my art room! We are creating Art Teacherin' Assistant Badges! The idea is this: create fun and cute badges that a select number of students in your art room can wear. These kiddos are your assistants which can mean anything you imagine from helping pass out and collect supplies to peer tutoring, reminding other kids of directions and much more. It's really up to you how you use your badges. 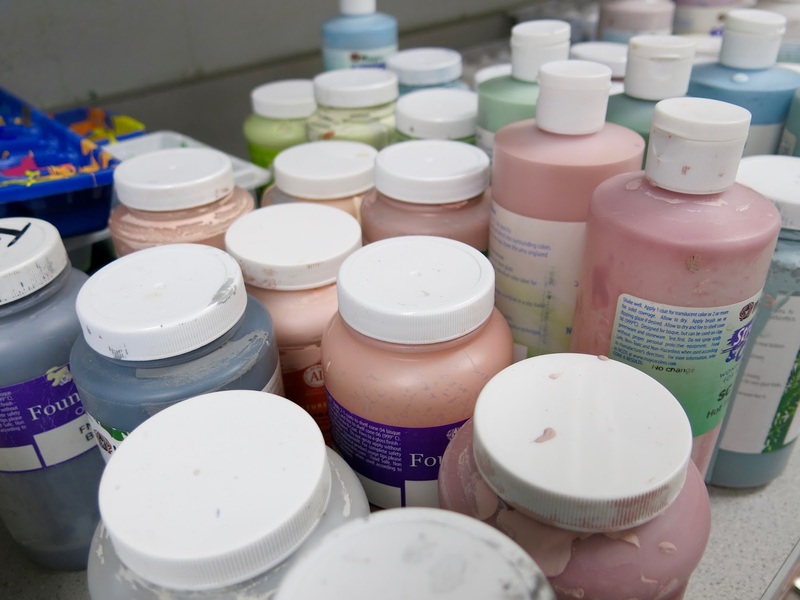 In my art room, I plan to create one per table (for me, that's four). 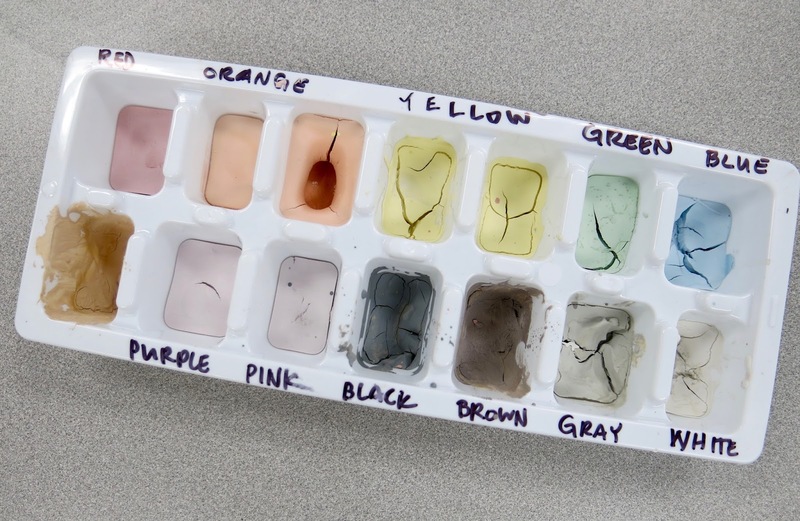 Students with questions will ask these Art Teacher Assistants questions (such as "where do I put my artwork? "; "where can I find this supply?"). The Assistant's job is to know the answer (which means listening extra carefully as your buddies are counting on you!) and if they do not, they are to seek out another Assistant. My goal is to do the following: empower my students! And, let's be honest, make it so I don't have to repeat myself bunches of times. I have a select number of friends that LOVE to ask me questions which I am quite certain they already know the answers to...just to (drive me bonkers) talk to me. I'm removing this constant exchange so that I am free to roam the room and have more meaningful conversations with my students...and not have to say, "WET PAINTINGS GO ON THE DRYING RACK. DO NOT BRING THEM TO ME. I AM NOT A DRYING RACK." Ahem. If you'd like to join the Make and Take badge making fun this Wednesday at 8pm CST, here is the list of supplies I'll be using and recommend. OF COURSE, you can bring and use any ole thing you want. Just so you know...badges will be featured in an upcoming blog post so you know you'll want yours to be the most glittery, sparkly, blingerly (yes, that's a word) in the universe. * Index cards, card stock, tag board, poster board, etc. Cut into 3" X 4-5" rectangles. These will serve as our badges that students can wear around their necks. Think of a good size for your kiddos. I'm going with index cards. * Packing tape. This is how I will seal my cards...or you could laminate them. * Sharpies, markers, gel pens. Whatever you might like to decorate your badges. 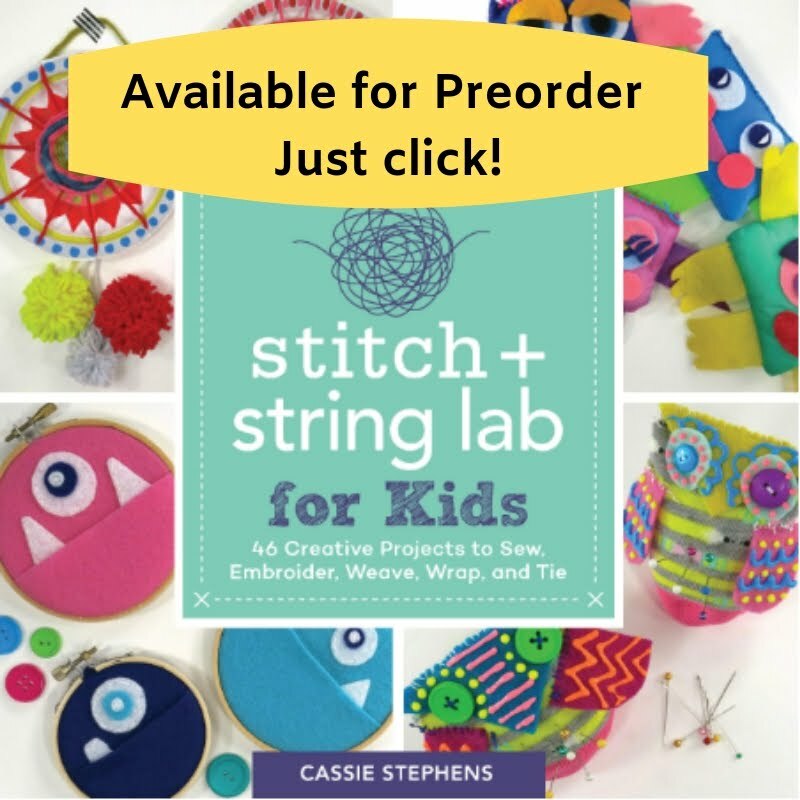 * String or yarn. So these can be worn. * Puffy paint, glitter, sparkle, bedazzler, etc. 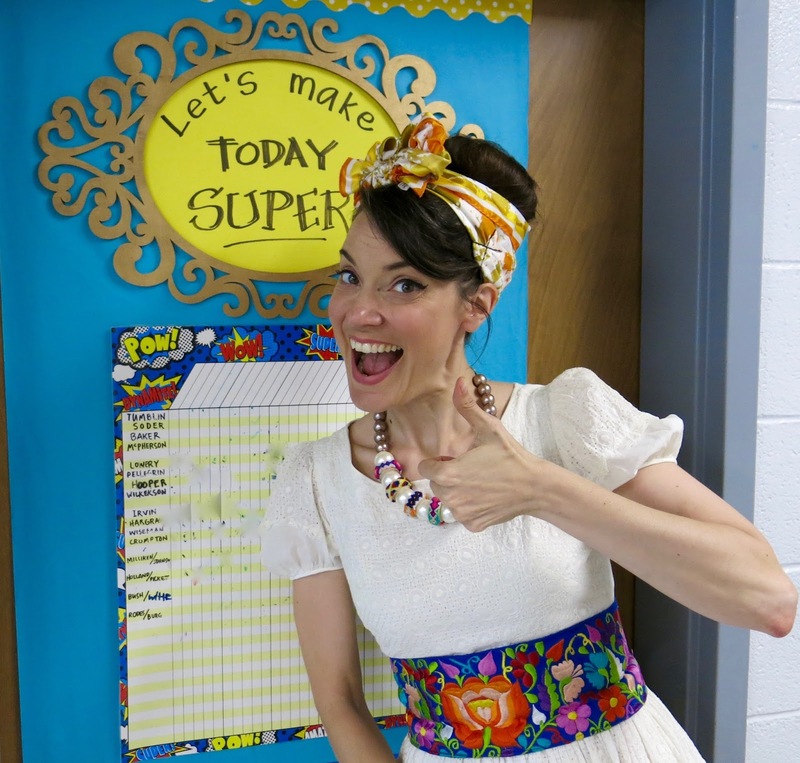 Any ole thing you can think of to make your badge one of honor that your students will love to wear! I'm so excited to create on Wednesday with y'all! I do hope you'll join the fun. 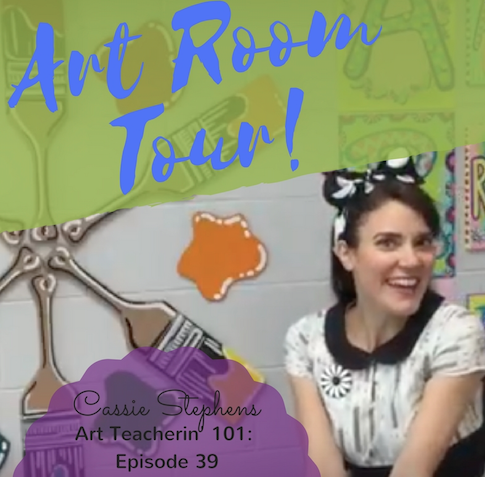 AND, in case you want more views of my art room, here's a video I created for my students of my art room. See ya real soon! Last night, over here, we had a fun live chat titled: What I Wish I Knew as a First Year Teacher. We chatted for nearly an hour and so many of you contributed to a wonderful chat. Thank you! If you'd like to view the chat or learn from the awesome comments, the chat is still archived here. 1. Befriend your custodians. They are one of your biggest allies. * A Craft Supply Store. Share your supplies sparingly. * Support Staff. You have your own curriculum. You were hired to teach art...when you can squeeze in other subject areas, AWESOME! But don't build your curriculum around anything other than the art education of your students. * The School Sign Maker. Do those favors sparingly, your time is precious! 3. Test Drive ALL of Projects. Make examples...not to necessarily show your students but so you can troubleshoot any issues they might have along the way. 4. Don't Sweat the Verbage. There is gonna be so much stinky-smelly edu-talk that it will make your head spin. Don't get caught up in worrying too much about the latest edu-trends. Because just when you think you have it figured out, they'll switch the script. 5. Keep the Peace. Stay away from Negative Nancys, Patty Pot-stirrers and Glinda Gossips. Nothing good can come from those friendships. 7. Seek a Mentor. Find a fellow art teacher and ask them for tips. See if you can go and observe them. Find a teacher in your building who you admire for his/her teaching style and seek their guidance. 8. CREATE! Make time to make stuff. This is what you teach! You gotta practice what you teach. 9. REST! Take time to unplug from school. You'll be a better teacher for it. 10. Reach Out. Attend your state and national art education conference, professional development opportunities and art classes. You can learn so much from other artists and teachers, reach out and find them! Love to hear your tips, y'all. Let's share with those newbies what we wish we would have known. Hey, y'all! I'm taking a break from tonight's usual Facebook LIVE session as the husband has requested a night out. Which will probably involve dining at the fine Southern establishment known as Cracker Barrel (who can deny those biscuits, I ask you, WHO?!) which I ain't above passing up. But I'll be back next Wednesday, 8 pm CST to chat about all things First Year Art Teacher-y! You can still catch our past couple of LIVE chats here. * You can say anything, ANY-STINKIN'-THANG, if you just choose your words wisely. It's funny, I'm super duper non-confrontational but have noticed of late that if I don't speak my mind (nicely) and stand up for myself (calmly) no one else will. It's time to wo-man up and say what needs to be said...in a way that will be listened to. * Speak with your end goal in mind. This is directly from my extremely wise husband. Do you want your end goal to be that folks pause, listen to what you have to say and give it some thought? Of course you do! So don't offend them with your words. Use words that will get you to your end goal: a conversation. * Say it with flowers. Does anyone else remember that old ad? I'm not saying send folks flowers, I'm just saying use words that are pretty and smell good not ones that stink and are offensive. Put yourself on the receiving end. Is that a bouquet of words you'd wanna hear? * Start with "I feel..." No one can argue with your feelings. Unless you are irrational and crazy. In which case they will just say, "well, she is irrational and crazy, so it would make sense she feels that way..." Be honest without don't be a drama queen. * Don't yuck someone's yum. This is a direct quote from my buddy Patty Palmer. I love it so. Say what you need to say but don't yuck someone's yum while doing so. Sigh. If only doing such was this easy, right? Practice makes us better, y'all. I find that being honest with your feelings and open enough to listen to other side of any conversation is the very best way to go. Love y'all! Hello, most amazing art teachers! In case you missed last night's super fun chat, you can find it archived here. Be sure to join the fun next Wednesday, December 28th where we'll be talking about the advice we'd have given our young art teacherin' self. Last night's chat was create but lengthy. I decided to put together my favorite take-away's in this week's Art Teacherin' 101. Be sure to follow me here if you'd like to see more 101's, lesson videos, One-Minute Art Teacher clips and a random Elf surveillance clip. I'll be creating a lot of new video content to go along with this new Classroom Management adventure that we'll be kicking off in my art room come January. Love to hear your favorite classroom management tips! Leave 'em below so we can all get better at this magical thing called teaching. Love y'all! Hello, Craziest Time of the Year! I know I'm not alone when I say WOW. Could things be any more bananas right now? And yet, would we really have it any other way? I think not. Adding to the craziness, I also decided to start sharing short videos on Instagram with y'all this week. Stay tuned for more of those. And if you've missed any, I'll be archiving them here. I also hosted my first Facebook Live chat this week! It is still up in case you missed. I'll be back this Wednesday at 8pm CST to chat about classroom management...something I know I'll be cracking down on after the holidays. Hope you'll join me! I'm still in school until Wednesday...here's to makin' it, y'all! 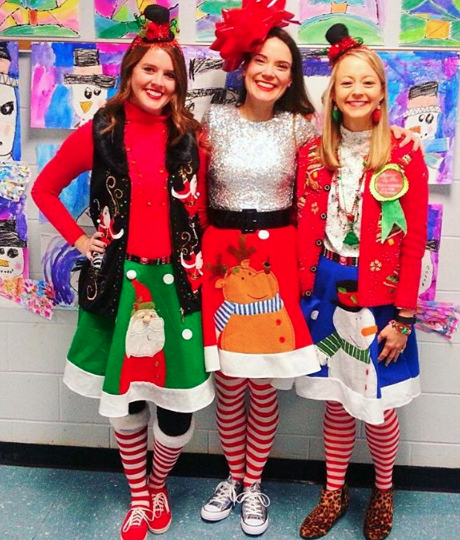 Last year, my kindergarten teacher friend Heather (left) and my second grade teacher buddy Bethany made these skirts from tree skirts found at Big Lots. We wear them every year for our annual Tacky Holiday Sweater day! Aren't they the cutest? We're so famous for our tacky, we were even featured on BuzzFeed! 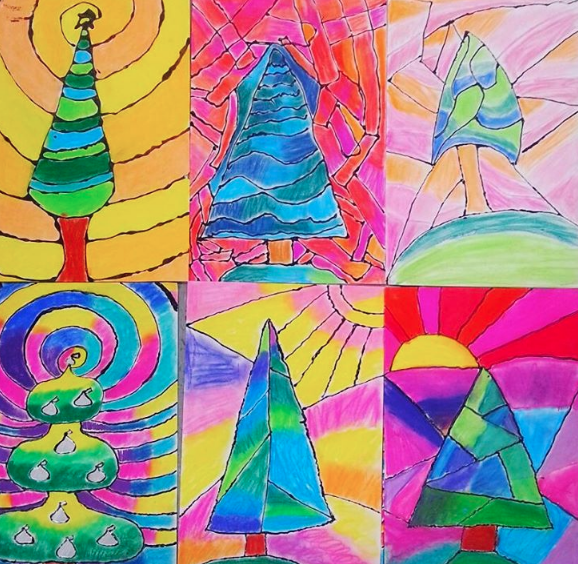 Fourth grade is rockin' and wrapping up their Faux Stained Glass project. I am so in love with their work! 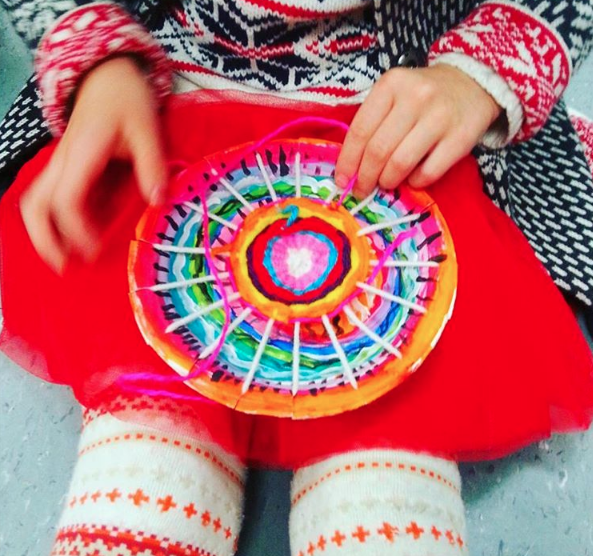 Second grade is weaving right now and it's just the most perfect project for this time of year. I see my second graders at the very end of the day when we are both tired. For the last week, we've been siting on the floor in a "Weaving Circle" while chatting, reading books and helping others learn to tie knots. It's just been the best way to end our day! This week, I went LIVE on Facebook! If you weren't able to join the fun, it is currently archived here. I'll be back this Wednesday at 8pm CST to chat about Classroom Management. I think that is on everyone's mind at this time in the school year. I hope you'll join the fun! I forgot to snap a photo on this day...but I did make a run to the grocery store. 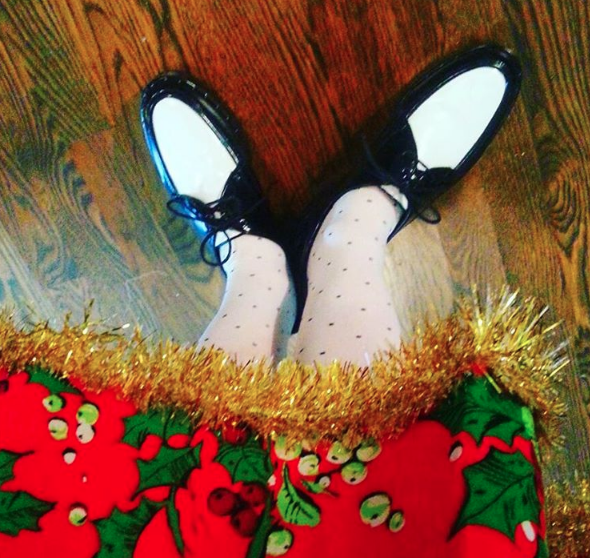 I was stopped by one woman who said, "My nana had a tree skirt in that same print!". I didn't have the hear to tell her that I probably was wearing her nana's tree skirt. Then a dude stopped me and said, "OMG, I was so going to wear that exact same outfit!" I told him it was a good thing he didn't seeing as how I looked so cute. Nobody wants to be the loser in a Who Wore It Best, right? 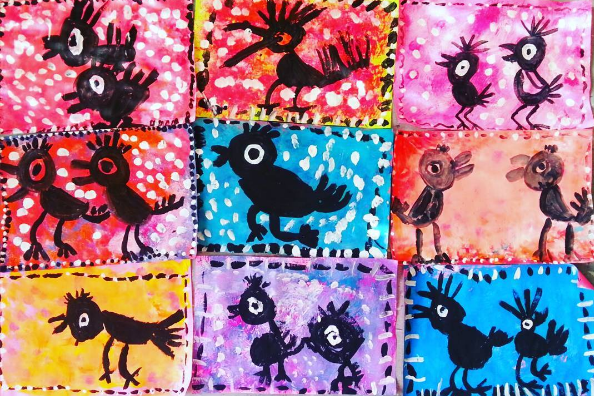 First grade had a blast painting their Bebo-inspired birds. I heard comments like, "I'm a serious artist!" and "I love painting" the entire time we were working. It was so sweet. 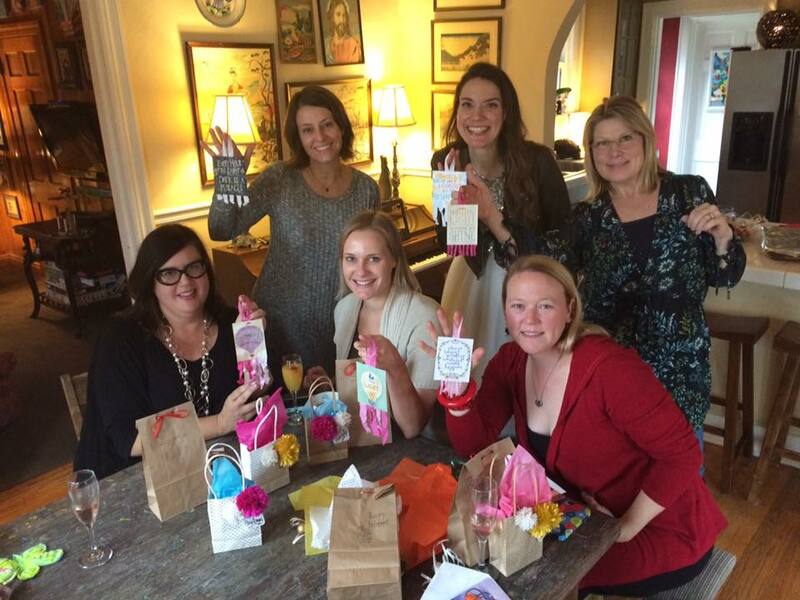 One of my favorite things ever is to host a craft night. I try to do one every coupla months but life just got so crazy this summer and fall, I just couldn't squeeze it into my schedule. I was determined to make a Christmas Craft Night a thing this year. 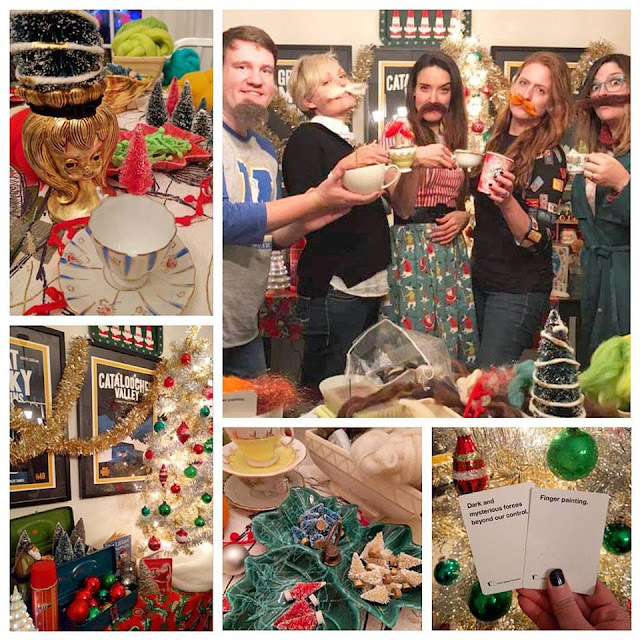 So I through out an impromptu invite and we had a house full of food, booze, crafts and laughs. We missed y'all who couldn't make it and so sorry we didn't get a photo with everyone! Our Christmas Crafts of Holidays Past here and here. 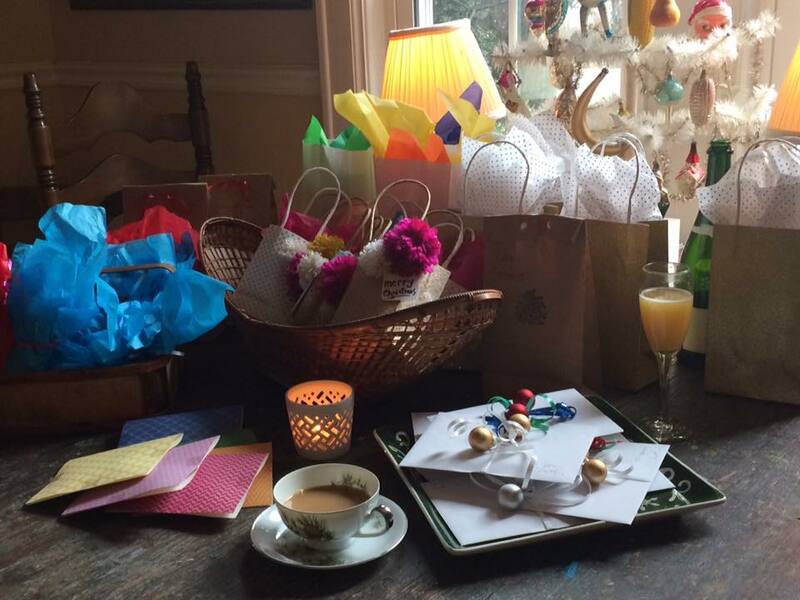 The next morning, I went to my first ornament exchange at my friend Camilla's home. I had the best time opening ornaments from these sweet ladies. What a wonderful way to share our talents! You can see my ornaments here. I hope y'all have a fabulous week! May it be full of friends and fun. Y'all can tell it's the craziest time of the year when I start multi-tasking my blog posts. 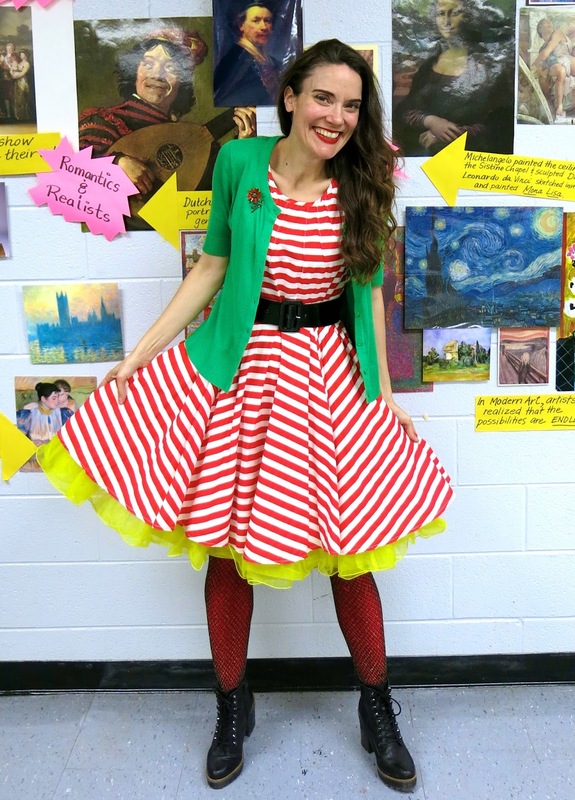 Allow me to introduce to you the first ever (and hopefully the last) What the Art Teacher Wore/Art Teacherin' 101/All Sorts of Other Stuff blog post! Yay! It's kinda like when your mama has too many small portion leftovers and decides that throwin' them all into a pot, heatin' 'em up and callin' it Goulash is making dinner. Welcome to my Bloggy Goulash. Grab your Tums. First order of business I want to share with y'all is that Other Stuff...I'll now be sharing one-minute videos on my Instagram, Monday through Friday! Be sure to follow me on Instagram to keep up with this new adventure. To join me during our Facebook Live chat, follow me here. And if you miss a video, all of them will be archived on my YouTube channel. I decided to do this because I remember what it was like my very first year teaching, in a portable (aka a trailer), isolated from the other teachers and definitely out of touch with other art teachers. I had so many questions! Now that I have almost 20 years under my sparkly belt, I thought I'd give back what I have learned (and am still learning!) along the way. If there are ANY questions you have for me, please feel free to leave them in the comments or shoot me an email (my address is to the right of this post). I'd love to hear any feedback about this new adventure, y'all! Now, on to this week's Art Teacherin' 101...LETTING GO OF NEGATIVITY. I know I've been sharing with you recently my feelings of stress and how I'm attempting to address it. This week things really hit the proverbial fan with an art show added to the mix. Don't get me wrong, working with Artome was A DREAM (blog post to come, y'all!). However, I was on the receiving end of some not super polite comments from colleagues and, I gotta say, I really allowed that to darken my day. This was compounded with some other things that have happened recently. I discovered an entire conversation about me that was happening in a private art teachers group and let's just say there were some very personal and unpleasant words spoken about me. That really wore me out. Unfortunately, I have the habit of allowing negativity to play on loop in my head. Shoot, the words typed out in this email from many moons ago by a fellow art teacher still ring in my ears: It appears your priorities of late are to make a costume a day and write your blog. That is fantastic and shows what a dynamic artist you are, but it leads me to ask, "Do you have time to be a FSSD Art teacher and honor those obligations?" So all that to say, we are ALL going through stuff. Everyone's got negativity to deal with. The best we can do is try our hardest to let it go. The black balloon visual works really well for me. Another thing we can do is NOT BE A BLACK BALLOON. Remember what your mama taught you: if you've not got anything nice to say then shut it. It's also good to know that you aren't alone. Keep that in mind when things start to wear you down. This time of year, everyone is tired and irritable. Just keep your head in the art teacherin' game and focus on the little artists who make you happy. 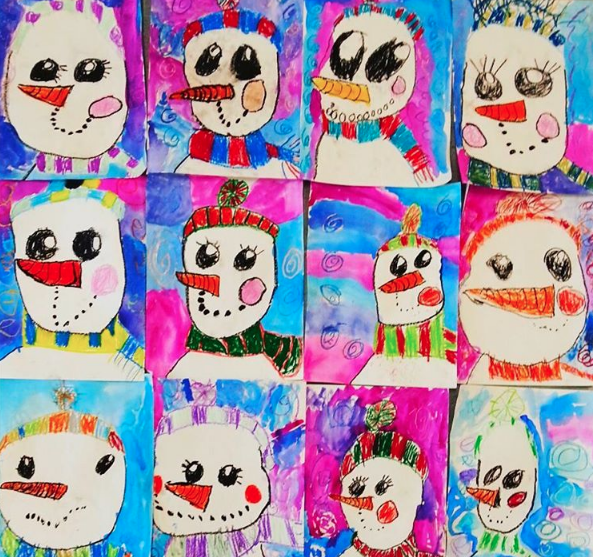 Speaking of, I love these snowfolks created in one day by my firsties! A good cry always helps. Mine have been coming in waves, sometimes out of no where. Just go with it. You'll feel so much better, I promise! Retail therapy always helps me...which is why I hit the thrift store so often, it's guilt free! Seriously, y'all, happy holidays. Stay positive, let go of that negativity and know that you aren't alone. Love y'all!